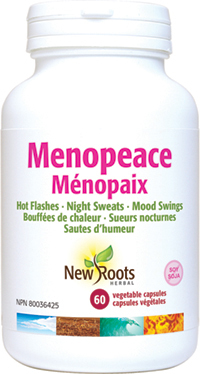 Menopeace helps a woman pass through menopause more smoothly, by helping to ease the hormonal ups and downs that can occur during this period of a woman’s life. Menopause is part of the natural life cycle of women. Menopausal symptoms affect about 70% of women approaching menopause. Typical menopause symptoms, such as hot flashes or night sweats, are caused by changing hormonal levels in the female reproductive system. Almost all women notice early symptoms while still having periods. This stage of gradually falling and fluctuating hormone levels is called perimenopause, which often begins in the early 40s. The symptoms of menopause usually last for the whole menopause transition (until the mid 50s), but some women may experience them for the rest of their lives. This can be an uncomfortable time for many women as they adjust to fluctuating hormone levels, hot and cold flashes, and a variety of other symptoms. Menopeace is formulated with isoflavones, terpenes, and flavonoids to help balance hormone production through menopause. The plant-based, estrogen-like properties of the isolates in Menopeace help modulate estrogen and testosterone levels, keeping them within normal ranges. As well, the natural ingredients help regulate estrogen to progesterone levels, for a smooth transition. Menopeace accomplishes this without the carcinogenic fears of hormone replacement therapy (HRT). Adult women (perimenopausal): Take 1 capsule daily or as directed by your health-care practitioner. Use for a minimum of 3 months to help stabilize menstrual cycle irregularities. Other ingredients: Vegetable magnesium stearate in a non‑GMO vegetable capsule composed of vegetable carbohydrate gum and purified water. Dong quai is employed in traditional Chinese medicine (TCM) to invigorate and tonify the blood. Our black cohosh extract provides a quality-assured means to what is often thought of as a natural alternative to hormone therapy. This form of boron is well-assimilated and helps to the absorption of calcium, to the production of testosterone, and to the optimal functioning of the brain. Red-clover isoflavones are estrogen-like molecules that may mediate hormonal imbalances during menstruation and menopause. Maca is a potent antioxidant with a rich history of therapeutic use for immunity, hormonal equilibrium, energy, stamina, and libido.